The measles titer checks for evidence of measles immunity in the blood. This measles test is also known as a rubeola titer. What is a measles titer? A measles titer, also known as a rubeola titer, checks for measles immunity in the blood. Why is a measles titer important? The measles blood test is used to confirm measles immunity in students and to meet healthcare worker credentialing requirements. This Measles Titer is a blood test. The measles titer, also known as a measles test or a rubeola titer test, checks the measles antibody blood level. The measles blood titer is an important test required by healthcare organizations and schools to prove immunity to measles. The measles titer test checks for the presence of IgG antibodies to measles in the blood. Measles IgG antibodies are made by the immune system if one has been exposed to measles in the past (either by prior vaccination or an actual measles infection). One is considered "immune" to measles if one has an adequate level of measles IgG antibodies measurable through a measles blood test. In the United States, most people will have received the mumps, measles and rubella (MMR) vaccine series as part of their routine childhood vaccines which typically confers immunity to measles. Measles is an infection caused by the measles virus (Morbillivirus). Symptoms of a measles infection include high fevers, cough, runny nose, eye irritation and a characteristic rash (traditionally known as "cough, coryza and conjunctivitis"). Highly contagious, measles is easily transmitted through droplet exposure from an infected person. Once infected, symptoms of a measles infection typically start one week after the exposure and continue for up to two weeks. Why is proving immunity through a measles titer needed by a school or employer? There are a few reasons. First, if a healthy person in one of those environments encounters someone who has the measles, the healthy person can easily be exposed to it. If none of the health people around have immunity, the measles infection could easily spread from person to person and cause a large measles outbreak. Given that a measles vaccine exist, most facilities believe that it is easier to limit a measles outbreak by making sure that people studying or working in a higher risk setting have immunity to the measles to prevent rapid person-to-person spread. While vaccination does not usually confer lifelong immunity, the blood titer is appealing because most people who have received the vaccine will still have immunity that can be detected on the measles IgG lab test for twenty years or more. The measles titer is frequently required in addition to a mumps titer and a rubella titer and the three titers together are sometimes referred to as an MMR titer. Getting a measles titer near you at a Quest Diagnostics lab is a relatively simple process if you have a lab near you as most lab locations carry the necessary lab testing equipment. The measles blood test requires a simple blood draw and results are usually available relatively quickly. The measles titer is frequently ordered with the hepatitis B titer and the varicella titer for additional titer screening. The QuantiFERON-Gold TB blood test is also often ordered to meet tuberculosis screening requirements with the measles titer. 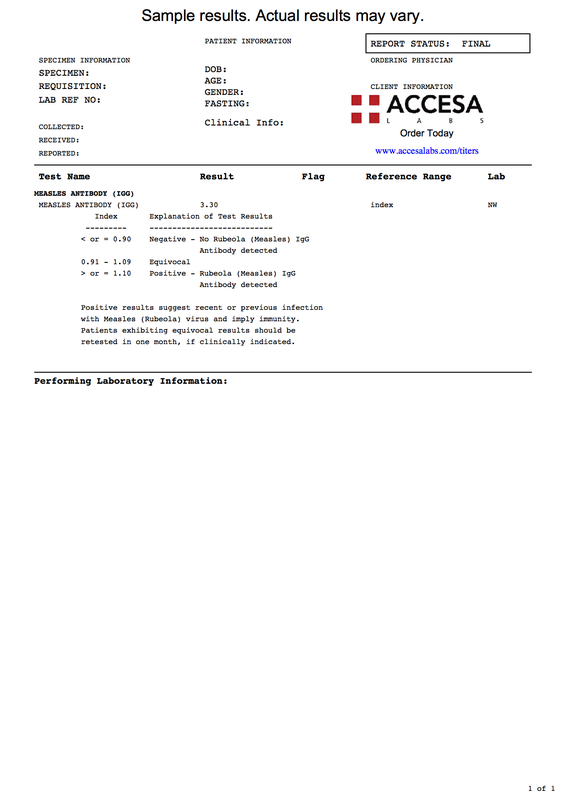 Our measles titer is a quantitative measles IgG blood test. In other words, the measles antibody level will be reported as a numerical value which is considered the gold standard. To evaluate a measles lab report, one simply compares their measles IgG antibody result against the reference range provided in the measles lab report to determine whether measles immunity is present. In the sample report we have provided, the measles antibody result reported is 3.30 and a positive result is considered to be a level > or = 1.10, thereby suggesting measles immunity. If the measles antibody level was in the negative or equivocal ranges, it would suggest that the person is not immune to measles. Because an isolated measles vaccine no longer exists in the US, this person would need to receive the MMR vaccine series again, even if already immune to mumps and/or rubella. The measles titer is a good way to check for measles immunity for anyone who has been previously vaccinated or infected with the measles virus. The measles vaccine was developed in the early 1960s to help prevent this contagious infection and led to a drastic drop in measles cases. In the early 1970s, the measles vaccine was combined with the mumps and rubella vaccines to form the MMR vaccine so that all the vaccines could be administered together. Over time, the MMR vaccine was incorporated into routine vaccine schedules and most people in the United States who underwent traditional wellness medical exams as a child will have received the MMR vaccine as part of their childhood vaccines. According to the World Health Organization measles deaths have dropped over 70% from 2000-2015 with the implementation of worldwide vaccination programs. There is no cure for a measles infection other than supportive care (e.g. oral rehydration) and treatment of any secondary complications that occur. Complications from a measles infection frequently occur and are more severe in people with weak immune systems, infants and the elderly. A positive measles titer is a widely accepted measure of measles immunity and avoids the need for additional MMR vaccinations. We hope you found this measles blood test report helpful. Measles Titer at Guaranteed Prices.